Gray, J. and Griffin, B. A. 2013. Eggs: Establishing the nutritional benefits. Nutrition Bulletin, Vol. 38, Issue. 4, p. 438. Alemany, Marià 2012. The problem of nitrogen disposal in the obese. Nutrition Research Reviews, Vol. 25, Issue. 01, p. 18. High-protein diets for appetite control and weight loss – the ‘holy grail’ of dieting? 1Poppitt, SD, McCormack, D & Buffenstein, R (1998) Short-term effects of macronutrient preloads on appetite and energy intake in lean women. Physiol Behav 64, 279–285. 2de Castro, JM (2006) Macronutrient and dietary energy density influences on the intake of free-living humans. Appetite 46, 1–5. 3Eisenstein, J, Roberts, SB, Dallal, G, et al. 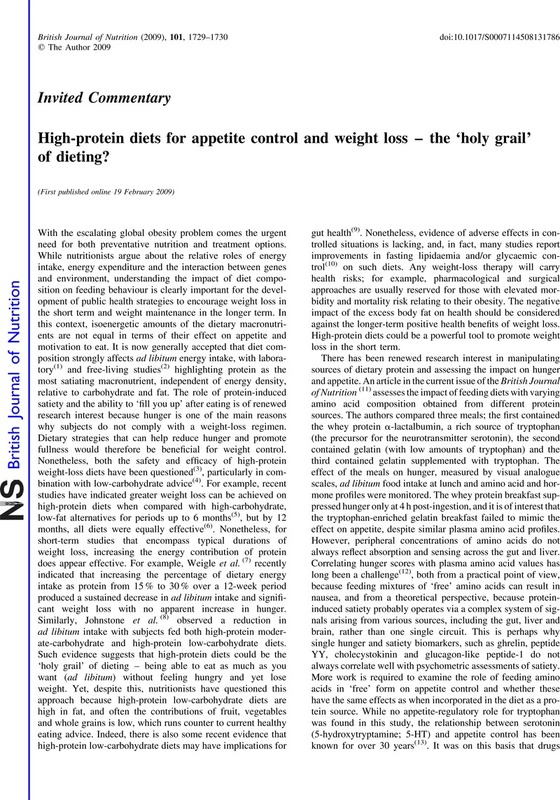 (2002) High-protein weight-loss diets: are they safe and do they work? A review of the experimental and epidemiologic data. Nutr Rev 60, 189–200. 4Bravata, DM, Sanders, L, Huang, J, et al. (2003) Efficacy and safety of low-carbohydrate diets: a systematic review. JAMA 9, 1837–1850. 5Skov, AR, Toubro, S, Ronn, B, et al. (1999) Randomized trial on protein vs carbohydrate in ad libitum fat reduced diet for the treatment of obesity. Int J Obes Relat Metab Disord 23, 528–536. 6Foster, GD, Wyatt, HR, Hill, JO, et al. (2003) A randomized trial of a low-carbohydrate diet for obesity. N Engl J Med 22, 2082–2090. 7Weigle, DS, Breen, PA, Matthys, CC, et al. (2005) A high-protein diet induces sustained reductions in appetite, ad libitum caloric intake, and body weight despite compensatory changes in diurnal plasma leptin and ghrelin concentrations. Am J Clin Nutr 82, 41–48. 8Johnstone, AM, Horgan, GW, Murison, SD, et al. (2008) Hunger and appetite response to a high-protein ketogenic diet in obese men feeding ad libitum. Am J Clin Nutr 87, 44–55. 9Duncan, SH, Belenguer, A, Holtrop, G, et al. (2007) Reduced dietary intake of carbohydrate by obese subjects results in decreased butyrate and butyrate-producing bacteria in feces. Appl Environ Microbiol 73, 1073–1078. 10Volek, JS, Sharman, MJ, Love, DM, et al. (2002) Body composition and hormonal responses to a carbohydrate-restricted diet. Metabolism 51, 864–870. 11Nieuwenhuizen, AG, Hochstenbach-Waelen, A, Veldhorst, MAB, et al. (2008) Acute effects of breakfasts containing α-lactalbumin, or gelatin with or without added tryptophan, on hunger, ‘satiety’ hormones and amino acid profiles. Br J Nutr 101, 1859–1866. 12Mellinkoff, SM, Frankland, M, Boyle, D, et al. (1956) Relationship between serum amino acid concentration and fluctuations in appetite. J Appl Physiol 8, 535–538. 13Blundell, JE (1977) Is there a role for serotonin (5-hydroxytrytamine) in feeding ? Int J Obes Relat Metab Disord 1, 15–42. 14Batterham, RL, Ffytche, DH, Rosenthal, JM, et al. (2007) PYY modulation of cortical and hypothalamic brain areas predicts feeding behaviour in humans. Nature 450, 106–109. 15Johnstone, AM, Welch, A, Horgan, G, et al. (2008) Central control of appetite during ketogenic weight loss diets: a positron emission tomography study. Int J Obes Relat Metab Disord 32, S24.